Distraught and grief-stricken over the deaths of her fiancé and brother, she left Hood Hamlet and her Christmas spirit behind, to start over somewhere new. But now, six years later, her family needs her. Carly returns home to face her past and give her niece and nephew the best Christmas ever. Burdened with guilt, Jake Porter believes he could have saved his two friends on that fateful day and kept Carly from experiencing such a heart-wrenching loss. When she arrives in town, Jake wants to make amends so they can both finally move forward with their lives. As Jake helps Carly experience the magic of Christmas so she'll embrace the holiday again, will he also be able to open her heart to something else she’d given up on…love? As a photographer who used to work weddings, this book was right up my alley! I totally connected to Jenna and her creative outlet. I didn't have much sympathy for Ashton in the beginning, but as their relationship began to rekindle I could see how much he missed her and still cared for her. There is a powerful theme of forgiveness which I can always use as an example in my life to do better with. 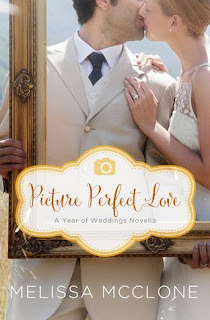 I enjoyed reading this novella; it's one of the top 5 that I've read in the Year of Weddings novella series. Visit author Melissa McClone's website to enter her blog tour giveaway! Like Melissa McClone on Facebook!